Sometimes it can be the simple things that are addictive. A task that initially seems easy to perform becomes harder as you strive for one better of your previous score. While not quite up there with the likes of Super Gravitron, Super Hexagon, and Atomic+, Cyberflow is an enjoyable, challenging and addictive game that will keep you coming back. You control two separate parts of a hoverbot that are connected by a constant beam. Both parts are controlled independently and you do this by using a finger on each. The only limit to the distance the two parts can be apart is the screen. As you travel through the levels you need the beam to pass through the boxes that litter the area – this gives you points – while avoiding obstacles. It sounds simple, and it is, but there is a challenge here. In the first level, the City Streets, there are buildings that upon impact will cause you to explode and lose a life, and as you progress through the game more dangers are introduced. The two parts control fairly well. They are responsive and smooth when you need to zip halfway across the screen to avoid a sudden danger. I've been playing with my index fingers with the kindle on my knees as the seven inch screen is a little big for my thumbs. After getting more used to the game I discovered by rotating both parts ninety degrees you can travel sideways and even back where you came from if you carry on rotating, though the camera angle doesn't rotate with you making it a little awkward. 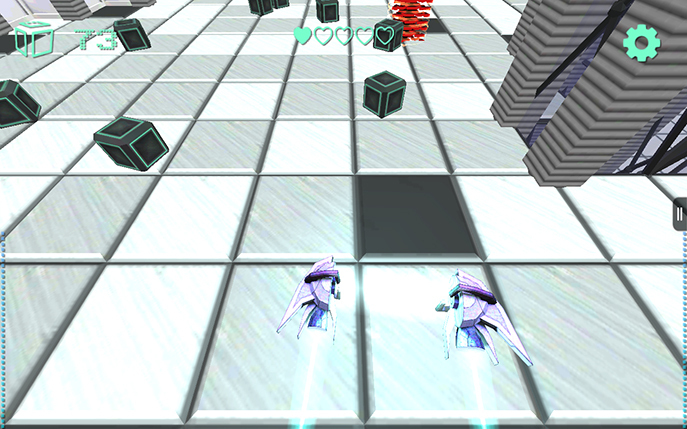 Throughout the game you'll need to squeeze through narrow gaps between buildings and stretch as wide as you can to collect as many boxes as possible. 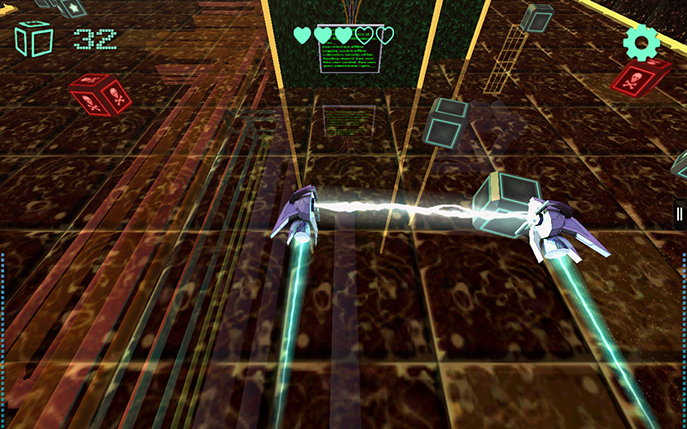 Boxes are plentiful in Cyberflow and you'll collect many in each level. The normal, undecorated box gives you one point, boxes with a star will give you ten and red boxes make you blow up upon collection. Later on you are introduced to a greater variety of box; boxes with a heart give you an extra life, boxes with a lightning bolt will collect boxes you pass near for a period of time and more. These can be scattered amongst each other so you'll need to be vigilant when you're collecting. This is a points based game and your main objective is to get the best score you can. While I've become pretty good at the first few levels - collecting and not crashing into the many obstacles - the more things you are required to navigate past or avoid the harder it is to concentrate on the boxes. The difficulty ramps up quickly and without giving you much experience, barring repetition. 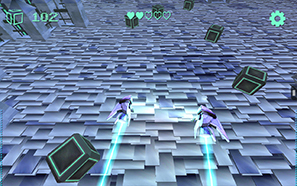 Enemies are introduced from the second area – The Lobby. 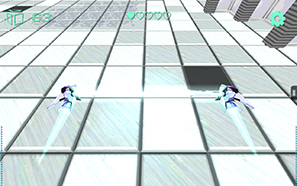 The turrets shoot at you and their projectiles can pass through your beam but will destroy either part of your hoverbot in one hit. However, if you let enough shots through your beam it will become charged and you can destroy the turrets by passing the beam through them. Cyberflow has a good presentation but the game itself looks okay. While I liked the visual design for the opening area, some of the subsequent areas have been less styled and not hugely pleasant to look at. The first area looks great; embracing it's sci-fi setting with a blue and green pallette and reflections in puddles of ships flying by overhead leaving colourful trails. The Laboratory and The Rooftops on the other hand are unpleasant to look at and awkward to navigate due to the bright colours and sharp textures. The buildings that act as one of your obstacles tend to clip if you pass too close beside them, obscuring a considerable amount of the screen – and occasionally the entire screen. I found this frustrating as it takes your concentration away with this notable distraction while you're trying to survive the area. At times like those you just have to hope for the best. Each level is procedurally generated but I've not seen a huge amount of variation in the presentation of boxes, buildings and enemies. Cyberflow has some problems, but it also has things going for it. I found the camera hampers your navigation when trying to do anything other than travel forwards, the clipping buildings can be a major distraction and a cause of death and some of the levels are lacking in visual flair. Despite this, the gameplay is a lot of fun and addictive and playing in short bursts is highly engrossing. The two parts of the hoverbot control well and it's fun having to concentrate on moving two ships. The better you get at the game the more enjoyable it becomes, as you strive to better your previous best. I've still got to get a lot better at the game and I will be playing more. My best score so far is around 380 and level 8 – The Reactor. 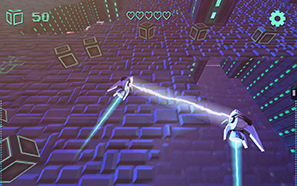 Cyberflow has a free demo which you can get here and I'd recommend you give it a try. You can upgrade to the full version to get all of the levels.